(The Rev. Canon) Hugh R. Page, Jr. is Professor of Theology and Africana Studies; and Vice President, Associate Provost, and Dean of the First Year of Studies at the University of Notre Dame. 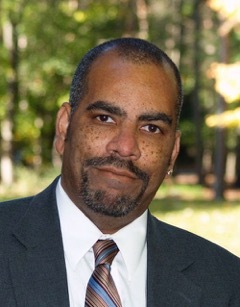 He holds a BA degree with a major in History from Hampton University; MDiv and STM degrees from General Theological Seminary in New York; a DMin in Applied Ministries from the Graduate Theological Foundation (Mishawaka, IN); and MA and PhD degrees in Near Eastern Languages and Civilizations from Harvard University. Among his research interests are the comparative study of ancient Near Eastern cultures; the ethnological criticism of Ugaritic myth and epic; esotericism and biblical interpretation in the Africana world; and the use of religious traditions and sacred texts in identity construction within the global African Diaspora. His sole-authored works include Israel’s Poetry of Resistance: Africana Perspectives on Early Hebrew Verse (Fortress, 2013); Exodus (Bible Reading Fellowship – Peoples Bible Commentary Series, 2006); and The Myth of Cosmic Rebellion: A Study of its Reflexes in Ugaritic and Biblical Literature (Brill, 1996). He is also general editor of The Africana Bible: Reading Israel’s Scriptures from Africa and the African Diaspora (Augsburg Fortress, 2010); one of the co-editors for both the Fortress Commentary on the Old Testament and Apocrypha (Fortress, 2014) and Esotericism in African American Religious Experience: “There is a Mystery” … (Brill, 2014); and editor of Exploring New Paradigms in Biblical and Cognate Studies (Mellen Biblical Press, 1996). He is also a Research Associate of Human Relations Area Files (HRAF) at Yale University.